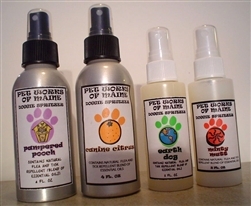 Good for a dog who loves the outdoors or when your four-legged friend smells a wee bit funky. Alcohol free. Available in 2 sizes (2 & 4 oz.). The 2 oz. size is packaged in plastic & the 4 oz. size is packaged in an aluminum spray bottle. 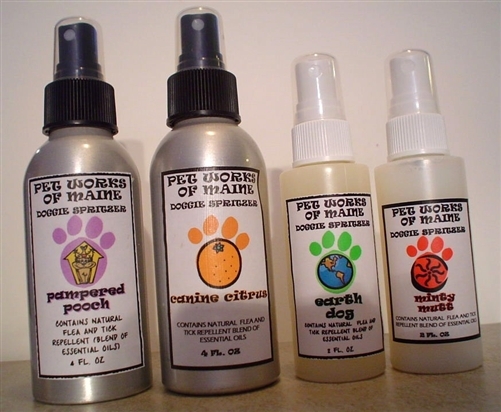 Ingredients: Distilled Water, Aloe Vera Gel, Vegetable Glycerin, Pure Essential Oils, Hydrolyzed Oat Protein, Tocopherol (Vit. E).